A wiggly pup waits beneath a Christmas tree. A teeny kitten brightens the Hanukkah festival. Nothing stirs the warm fuzzies more than a furry addition to the family. 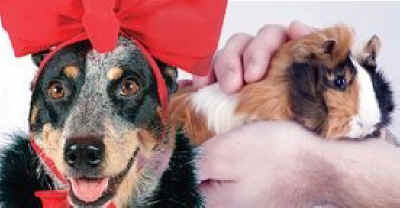 In fact, marketers urge shoppers to wrap Fido or Fluffy in red ribbons, for the perfect holiday present. But when the bows come off, an animal stumbles into an unfamiliar world strewn with holiday clutter. More importantly, Fido and Fluffy don't come with instruction manuals stamped: "A Lifetime Of Responsibility." In fact, the average life span of a dog is 12 to 14 years. Cats may live from 15 to 17 years. Even goldfish are around for 7 years. The American Society for the Prevention of Cruelty to Animals (ASPCA) calculates expenses for a single animal's food, supplies, medical care and training to be $700 to $875 annually. Costs creep into the thousands when health complications, superior food products and pet sitters are added to the equation. Animals make bad surprise gifts. Dogs and cats soil furniture, chew rugs, slobber and scratch. Anyone who acquires a puppy or kitten without prior scrutiny may grow frustrated with unanticipated growth spurts, behavioral challenges, or grooming needs. Once the cute factor fades, live gifts often wind up at the community animal shelter -- so "someone else" can give them a better home. According to ASPCA documentation, 60% of dogs and 70% of cats who enter shelters are destroyed due to lack of space, illness, or un-adoptability. "My kids will be thrilled to find Fido wrapped in bows. Why is this bad?" On a physical level, it is never safe to tie animals in ribbons, enclose them in boxes, or leave them unattended. Young animals chew and digest anything in their path. Waxy-coated papers or bows can obstruct a tiny kitten's stomach and require emergency extraction. materials about guardianship and training. More alternate gift ideas are toys, beds, leashes, bowls and other gear. Sharing "pre-pet" time with a child can be a fun and rewarding experience. Impulse adoptions exacerbate the pet overpopulation crisis. Shelters nationwide see a surge in surrenders after Christmas, Valentine's Day and Easter. "The holidays, and weeks just after, promise to fill more cages and quarantine rooms...in animal shelters across the [New Jersey and New York] region," writes Tim Norris, of NorthJersey.com, about the overflow at Ramapo-Bergen Animal Refuge in Oakland, NJ. "A fair number of arrivals will come from well-meaning adopters who misjudged the commitment." companion, if paired with the right person. "Uncle Harold is dead set on surprising the kids with a dog." Givers determined to celebrate with live gifts must handle early care vital to an animal's well-being. No one wants a present who comes with steep veterinary bills or the possibility of death. parasitic, viral or fungal infections. All must be screened for Feline Infectious Peritonitis (FIP), Feline Immunodeficiency Virus (FIV), and Feline Leukemia Virus (FeLV). Many veterinary hospitals offer puppy or kitten "packages" that include vaccinations, spay/neuter procedures, and microchip implantation. Most animals have a bit of wanderlust in them. Microchip identification is the best defense against permanent loss. An animal's temperament is more difficult to prearrange. Still, adopters can research which species, breeds or mixes are best suited to a particular human environment. For example, are toddlers and nipping puppies a good match? Can two working parents handle a robust dog who needs regular exercise? Should longhair shedders inhabit a neatnik home? "Where should we look for a new animal -- breeder or shelter?" Adopters can visit animal shelters, rescue/foster groups, and online networks such as Petfinder.com to find their furry soul mates. Many mistakenly believe that shelters have no purebreds. In fact, puppy mill and breed-specific rescue groups cater to pedigree darlings. The National Council on Pet Population Study and Policy (NCPPSP) found 25% of dogs at shelters are purebred. There are myriad reasons to adopt animals, rather than purchase them from breeders or pet shops. The HSUS estimates "thousands upon thousands" of puppies and kittens are born everyday. Squeezed into the nation's 6,000 to 8,000 shelters, just 3 to 4 million animals are ever re-homed. The rest are killed. Even when reputable "backyard breeders" find homes for every litter, they unintentionally put pound pets on death row. Stray animals propel the overpopulation tragedy with countless offspring. One female dog and her young can produce 67,000 puppies in 6 years. A cat and her litter can create 420,000 kittens in 7 years. With more animals than loving homes, shelter adoptions and extensive spay/neuter programs are the only viable solutions. Furthermore, the wide-eyed pooch in the pet shop likely began her life at a commercial enterprise where puppies are mass-produced. Profit-driven "puppy mills" typically fail to provide adequate veterinary care, diet, exercise or shelter. Large sites house up to 1,000 dogs in rusted chicken wire cages heaped three or four tiers high. Urine and feces seep into lower cages. Dogs at the top swelter in the summer and freeze in the winter. store pups were sick or carrying diseases. "We're all animal lovers. Is there something I can give in place of a live gift?" Compassion is a powerful lesson and animals tend to awaken a child's first sense of empathy. Animal-themed books make wonderful gifts for youngsters, teens, and adults. Farm Sanctuary, Humane Society of the U.S., United Poultry Concerns, PETA and other animal advocacy organizations sell books from their websites. A simple Internet search using terms like "Animal Books" produces lists with titles, authors and publishers. Along with books, animal groups commonly offer educational materials, games, magazine subscriptions, clothing and toys with a humane theme. Sponsorship, membership or volunteering with a life-saving organization is a meaningful gift for people of all ages. Shelters rely upon volunteers -- to clean cages, sweep hay, fill food bowls, walk dogs and socialize animals. Most won't let young children volunteer, but teens are usually welcome. Parents can arrange educational tours for the entire family, a school classroom, or even a birthday party. At Farm Sanctuary (Watkins Glen, NY), Animal Acres (Los Angeles), or Longmeadow Rescue Ranch (Union, MO), kids can meet rescued farm critters and "adopt" one via a reasonable donation. They're able to follow the life of their pig, cow, horse or hen through photos and stories. Few gifts are as precious as an animal's bottomless love. In return, we promise a warm lap, a full bowl, and guardianship for life. No one can make these promises for another. The decision to nurture a life comes from within.